arts-4-all: Can this year be over already? Can this year be over already? Up and out early this morning to search for the perfect blip foto (click on the blipfoto widget in the righthand column) for this last day of the year. Always have a stash of stale bread (mostly bread crusts the grandkids simply won't eat...) so took that stash along. 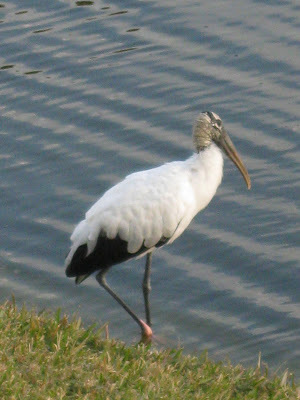 I was delighted by the magnificent Wood Stork who appeared. He disdained the taste of the bread after one tiny peck, but continued to linger close by and 'pose' for a few photos while he fished for a breakfast more to his liking. These were taken looking down from the second floor balcony just outside my apartment. He's a beauty! As is the one Glossy Ibis..... As always, click on a photo to get a larger view. Love the texture of these feathers highlighted by a rising sun! Beautiful beautiful birds - obviously too superior for old bread crusts! Great photos. They are beautiful birds! Especially love that gorgeous sheen on the wing. Thanks for visiting my blog and hope you have a great year. Sooziii - thanks for joining up! Will follow you with pleasure. Beautiful, beautiful photos. Thanks for stopping by the Gathering Nest. HAppy New Year! Great photos. How fofrunate to have such lovely creatures so close by. Thank you for your lovely comment you left on the Chocolate Cat blog. Happy New Year. Indiana and his parents.